Hey true believers, It is Dec. 13th 2008. My 12th wedding anniversary! Yes that is 12 years of martial bliss. I'm blogging and she's at the laundry mat washing some blankets that the kids peed on last night. OOOh the sweet happiness that is mawwage! Well I do have some exciting news I will be doing my first ever exclusive signing at Black Cat Comics (Dec. 20th) in Salt Lake! 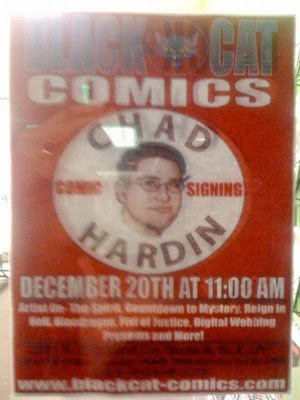 I've done signings before (at Dragon's Keep on Free Comic Book Day) but this time I'm the only "Cat" that is going to be there; so its special to me. Of coarse the signing has more to do with the fact that I'm friends with Greg the owner (and I pal around with Jimmy on the Geekshow podcast forums), than the fact that I'm some big huge name or anything. That's what friends are for; right? Right! That and the fact that Greg had to figure a way to get me to come up so I could empty my hold. So take note kids. Be cool to your local comic book store owner, never empty your hold and good things will happen to you too (I kid, I kid)!!! Well that is all for now. See you next week. I'll make sure to post some Spirit artwork in celebration of The Spirit issue #23 will be out and the release of the Spirit movie (directed by Frank Miller). In the mean time lets all drink some eggnog and try not to trample some poor old dude opening the doors at WalMart (calm the eff down people). Thank you to Tracy my ever loving friend for sending me a jpeg of the flier for the signing (NO SKETCH CARD FOR YOU JIMMY)! Remember its Dec. 20th @ 11:00am Black Cat Comics in Salt Lake. Be there or be square! Nothing worse than what I'm thinking about it... Seriously, though, thanks for braving your way through the winter h*** to sign Saturday. (see, I can make it all ages, too. It just takes a lot of effort with me. )It was a lot of fun!